Excavations at Ardnadam between 1964 and 1982 revealed a very long sequence of occupation and use of the site. There is evidence of Neolithic occupation of the site – perhaps 5,000 years ago – and an Iron Age round-house and enclosure wall. Within the wall are the remains of an early Christian chapel, possibly built deliberately within the enclosure when it was still in use. The remains of an altar at the east end of the chapel remind us that churches and chapels in our period usually faced east, towards the rising sun. Christians remembered that Christ was the sol iustitiae ‘the sun of justice’, and that when the prophet Malachi said ‘the sun of righteousness will rise with healing in his wings’ (4:2) he was understood to be talking prophetically about Christ. During the Mass – whether in a tiny chapel like this or in a huge cathedral – the priest and the congregation prayed together facing east in a dramatic enactment of hope, facing that rising sun. 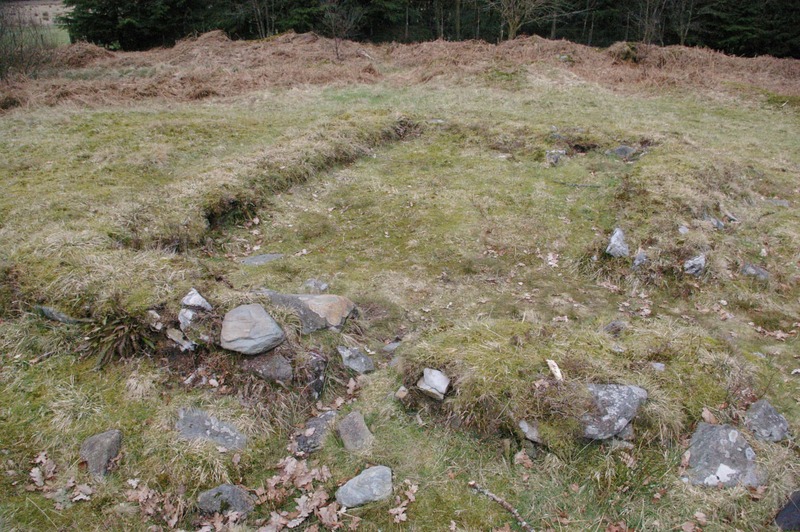 The footings of the chapel at Ardnadam. A paved area was found about 5 meters south-west of the chapel in the midst of which was a post-hole which may once have had a cross standing in it (no trace survives of such a cross however). A number of burials were also found nearby, many of them containing quartz pebbles. Some of the burials were marked by small upright stones, and some of these were marked with a cross. Sadly we have no record of any saint who was honoured at this site. The place-name Ardnadam did not apply originally to the chapel, and is in any case of no help. It is probably Gaelic àird an daimh, ‘height of the stag’ (though modern pronunciation disguises this), and has nothing to do with anyone called Adam. A pleasant fifteen-minute walk away (NS161800) are the remains of a badly damaged but still interesting Neolithic cairn, popularly known in the nineteenth century as ‘Adam’s Grave’ or ‘Adam’s Cave’ – presumably arising from a misunderstanding of (or jocular reference to) the local farm name, Ardnadam. 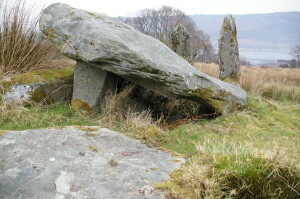 The huge slab of the top of the burial chamber is still there, along with what may be the two ‘doorposts’ of the entrance, and several other massive stones. Of course, it predates the chapel by three or four millennia, but it is a fascinating site, and well worth a visit. It is one of a number of sites in Ardnadam Glen from this period when people first began farming, growing crops and domesticatiing animals, so becoming less dependent on nomadic hunter-gatherer practices. ‘Adam’s Grave’ , so called – the neolithic burial cairn by Ardnadam. There is a little car park a few minutes walk from the chapel. For Ordnance Survey map of showing how to get to the Ardnadam car park, and of the surrounding area, including roads and footpaths, click on ‘View Larger Map’ below.